Welcome to the Davies Family Research Library! We invite you to explore the world's largest collection of Oregon-related materials, including photographs, manuscripts, books, maps, oral histories, motion pictures, videotapes, newspapers, ephemera, and much more. All our resources are available to everyone. Note that some library materials are stored off-site and must be ordered a week in advance. For information, please contact us at libreference@ohs.org or call 503-306-5240. 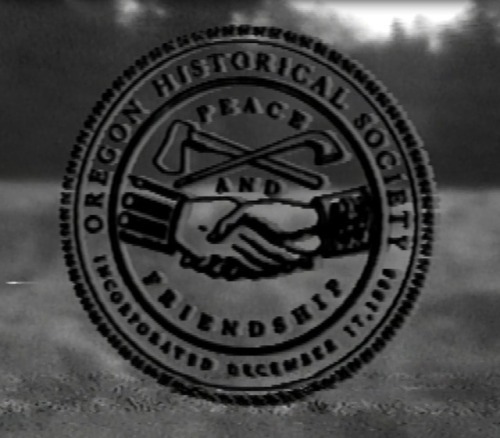 The Oregon Historical Society Research Library is open to any researcher, professional or non-professional, who is working on a specific research project. There is no charge for admission to the Research Library. Learn how to use the resources of the Oregon Historical Society Research Library to perform many different kinds of research. To celebrate the Oregon Historical Society Digital Collections’ first year, we’re sharing some of our staff’s favorite items from the website. Do you have a favorite image? Share it with the hashtag #happybirthdayohsdc ! “This was in the first batch of Finley materials we put up. While the wildlife photographs are amazing, and the quality of images is striking, to me, scenes like this stand out. “As the person digitizing the Oregon Journal collection, I've handled literally thousands of images, but every so often, one really sticks with me. I never cease to be delighted that Mrs. George Loy's penetratingly skeptical gaze has been immortalized on film. Turkey and two dogs, one carrying hatchet. 11 large format maps from the OHS Maps Collection have been digitized and added to our Digital Collections site. Many of these appear in Experience Oregon, and in the Spring 2019 issue of the Oregon Historical Quarterly, which includes and article by Stuart Barker about the development of the Oregon Skyline Trail from a scenic highway to an eventual hiking trail during the 1920s and 1930s.